Hello. Please excuse the broken links. We are in the process of revising some of the articles. Thanks. Click through the linked Table of Contents to the right. Click the link at the bottom of each article that connects to the next page. I start with the ancient cultures who thought a great sea, called Oceanus, circled the earth. The ancients developed the technology for reading the stars that Christopher Columbus needed to cross the Atlantic in 1492. After he did so, Queen Isabella of Castile dubbed him Admiral of the Ocean Sea. Once you study the winds and ocean currents between the old world and the new, you can see how easy it was for a ship to sail from one to the other. The Portuguese called the currents the Volto do Mar [Turn or Twist of the Sea]. The currents flow clockwise every day of every season. 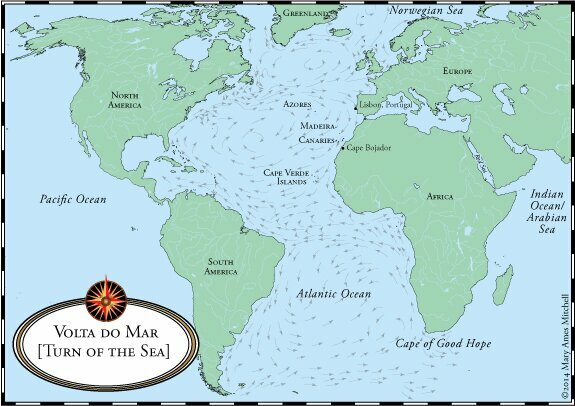 Theoretically, if you drop a cork in the water off the coast of Portugal, it will bob to the Canary Islands, then float to the Cape Verde Islands, where it will whisk across the Atlantic to the Outer Achilles Islands and on to Florida. Then the Gulf Stream will swoosh the cork northward. If the cork does not get stuck on a reef as it passes the jagged Outer Banks of North Carolina, it will continue north past Cape Cod and Nova Scotia where the easterlies will transport it back across the Atlantic through the Azores archipelago home to Lisbon. On June 15, 1876, answering a dare from his fishermen friends over a game of cards, thirty-year-old Alfred “Centennial” Johnson sailed out of Gloucester, Massachusetts, in a sixteen-foot open dory to cross the Atlantic. He averaged seventy miles a day. He capsized once during a major gale. He arrived safely in Abercastle, Wales, on August 12. The trip had taken him fifty-eight days. Today there is a biennial Atlantic Rowing Race that starts in the Canary Islands and ends up in the West Indies, a distance of about 2,550 nautical miles [4,700 kilometers]. Crews of six or less sail in twenty-four-foot boats. The winner of the race in 2006 had made the crossing in 39 days. As you no doubt know, with new technology – such as DNA tests, the ability to study Earth from satellites, and methods for determining the age of artifacts – our understanding of history changes every hour. That is why I chose to publish this collection as a web-book rather than a print book. Not only does this format allow me to update information, but it lets me include all the color maps, graphs, illustrations, and photographs I want without worrying about printing costs. Please, send me your feedback, corrections, and additions through the email links at the end of each article. I can easily incorporate them. I hope you enjoy this information as much as I do. First, just a few notes about discussing time.